Absolutely love it. Such a refreshing change ! Excellent show with mystery, humor, suspense, and great acting wrapped into one FANTASTICALLY addictive show!!! 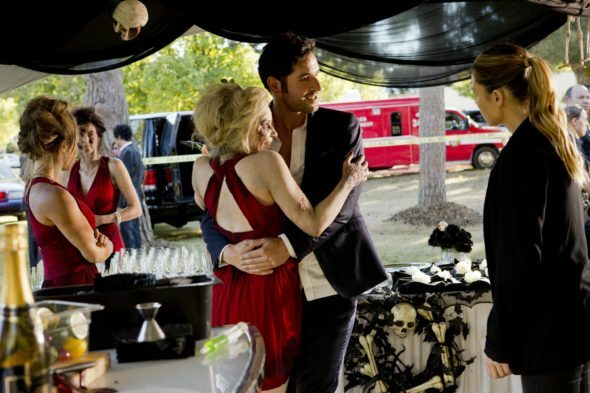 Tom Ellis is the hottest devil I ever saw!!! Please renew for a Season 3!!!!! Great show! Me being a fellow SAG/AFTRA actor on a Fox Show also this season I can always tell a winner! The satire takes some getting used to but once you get it you’re hooked! As long as the show mixes it up in each episode produced this show will get a third season! This is my FAVORITE and my husband’s FAVORITE show on the air! We LOVE the cast, and its addictive humor and storyline ! PLEASE renew for Season 3 PLEASE! Love, Love, Love this show. Can’t wait till Monday!!! Please keep it going. Watch one episode, you won’t be disappointed! Look forward to Lucifer every Monday. Love the humor and the evolving of Lucifer’s “human emotions”. Great show! Let’s hope we can get at least 5 years out of it. Never really been into tv shows, more a film person, but love Lucifer! Everything about it is great! Its got a bit of everything, can’t wait for the next episode each week! I like the show, was pretty surprised how good it is as its title was not very promising. Wait for more than 2 seasons. Great news!!! I love this show. I love this show!! I hope it will have a 3rd Season. Can’t wait to watch tonight’s episode. Thank you, Fox!!! Absolutely the best show on Fox. My entire family watches it every Monday.